According to Wikipedia, the French formal garden, also called the jardin à la française (literally, “garden in the French manner” in French), is a style of garden based on symmetry and the principle of imposing order on nature. 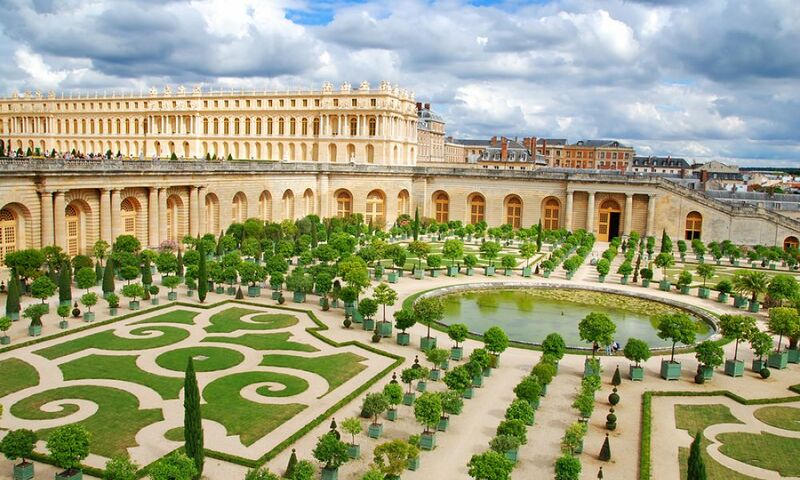 Its epitome is generally considered to be the Gardens of Versailles designed during the 17th century by the landscape architect André Le Nôtre for Louis XIV. The residence should be the number one focal point in the French landscape style. The home is often the center point of the design with large paths that provide axial views. A clear geometric plan, as virtually everything in the design is geometric and planned with symmetry. A central axis, perpendicular to the facade of the house, on the side opposite the front entrance. The principal axis is composed of a lawn, or a basin of water, bordered by trees. A terrace that overlooks the entire garden so that all the detail can be viewed at once. The essence of a French Garden is the demonstration of the mastery of man over nature. all trees are planted in straight lines and carefully trimmed. Flowers have a restrained colour palette. Paths tend to be gravel and edged with clipped hedges and topiary laid out in symmetrical patterns. Planting beds or parterres are created with intricate patterns from hedged shrubs or planting beds are usually designed in near proximity to the residence. These designs are less detailed the further away they are from the house. Water is incorporated as a number one element within the landscape. Referred to as “reflecting pools” in circular, oval and rectangular shapes. Statuary is often used in French Garden Design. Pavilions and ‘follies’ are often incorporated too. While spectacular to look at, this garden is not for everyone.